I'm a hardware geek. Not really into the gadgets, but I like the tech behind workstation-type systems: CPU's (realworldtech is amazing, so is Anandtech), GPU's and so on. Aside from reading it is of course also nice to build something every now and then. 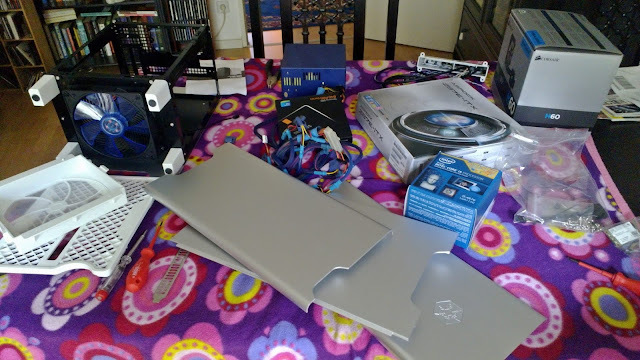 So this summer, just after Intel released their new Haswell CPUs, I decided to build a new desktop system around it in a Silverstone FT03 Mini. Goals were to have it as quiet as possible (cooled by a single 140mm fan) and of course have very decent performance. 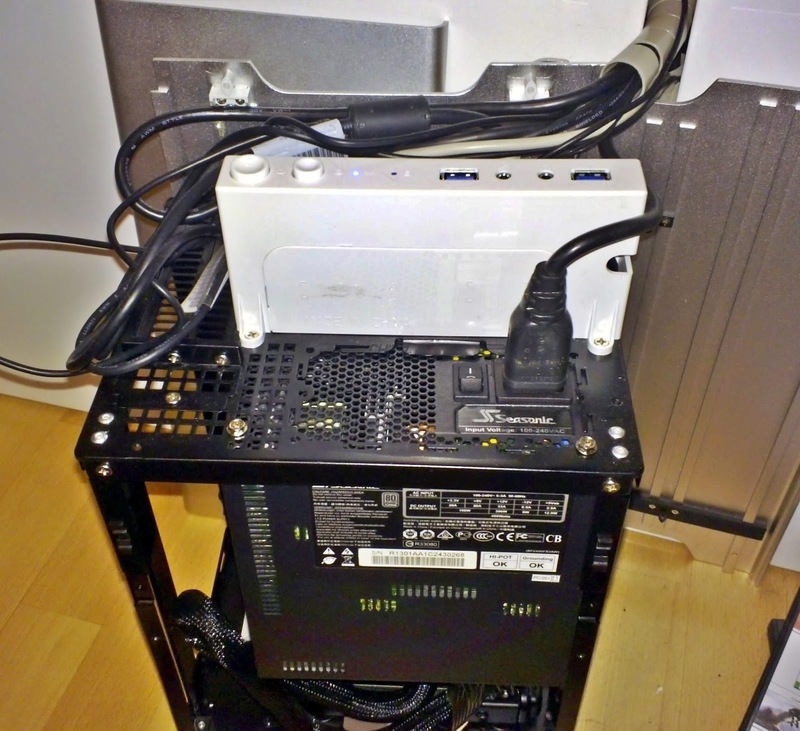 As you might have guessed from the name, the case isn't very big: mini-ITX. 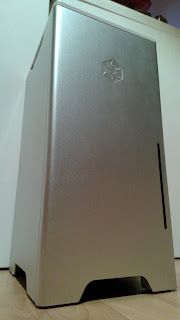 And it is a rather unusual design: a standing tower with a single 140mm fan on the bottom and solid aluminum walls. Quite a beauty, if you ask me. A review here. I ordered a Core i5 4670 - not a K one as those miss out on some of the new instruction extensions. Yes, that is actually called Product Sabotage. Well, Intel is not a charity and there simply is no competition in the space above the core i3 performance levels so they have to differentiate their products to extract the 'consumer surplus'. Aside from the CPU, there's a 256GB Samsung 840 Pro SSD (2.5"), 2x 8GB ram and it is all connected to a ASRock Z87E-ITX motherboard. I also have a passively cooled Zotac GeForce GT 640 Zone Edition graphics card, but more on that later. For cooling I used the recommended all-in-one watercooling - a simple Corsair H60. I contemplated going for a H80 (double-thick cooling block) but that would simply be overkill for the platform and make building it all harder. I've replaced the 140mm silverstone fan with a more quiet Noctua (NF-A14 FLX), which, at its lowest speed, is indeed very quiet. The whirring of the water pump is actually the noisiest thing about the case although it is barely audible. I did do a few unusual things with the case: I took out the HD cage (I only need one 2.5" SSD) and the slimline DVD player cage to make room for a full ATX modular, Platinum-rated, fully passive Seasonic power supply. The SS-400FL2 required some some creativity in attaching it and the bending of a single metal bar to fit it in - and of course, the tiny space gets even more cramped. But it isn't a huge stretch and it seems Silverstone could easily add a screw hole or two to make this officially supported. 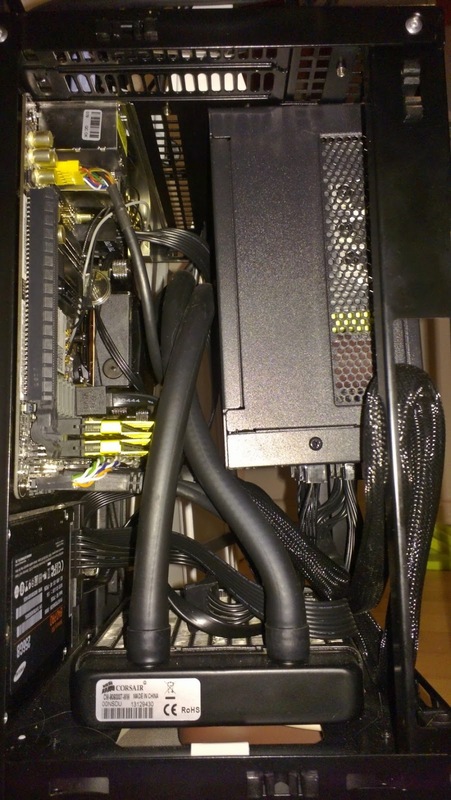 Graphics card - u no fit? 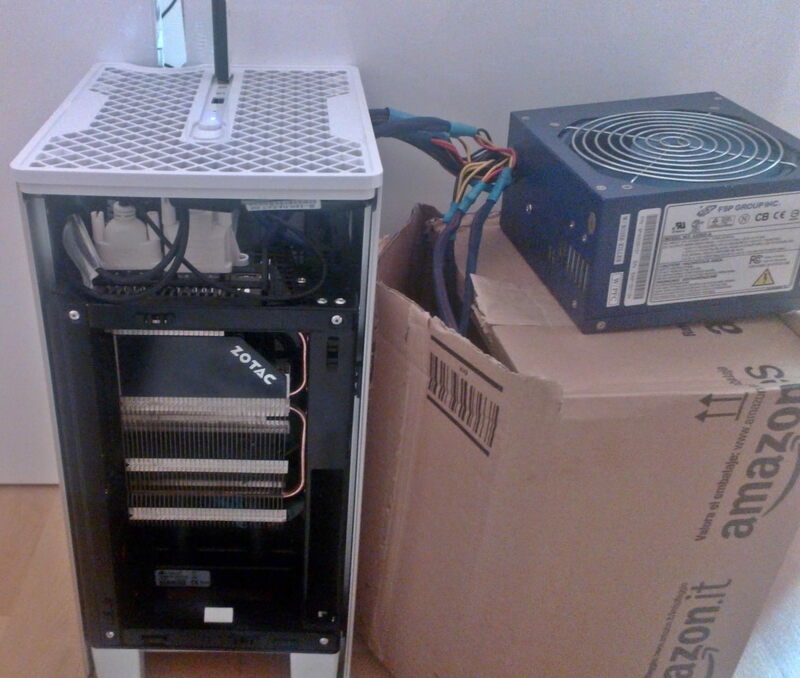 Unfortunately I got in trouble after my new power supply arrived: it didn't fit with the video card. The video card has a huge cooling block and its cooling fins are extruding on the back of the card. Unfortunately, that is where the power supply had to be - the price for not opting for the recommended small form factor variation. No place for the Zotac card. I did also replace the badly supported Broadcom wireless mini-PCI-express card that came with the motherboard with a decent Intel one (Ultimate-N 6300). I couldn't get the broadcom to work under Linux, the Intel card of course worked out of the box. It is a triple band card but unfortunately I still can't get decent speed out of it - more than 50MB/s won't work and I've got a 100MBIT connection so that's a bit sad. 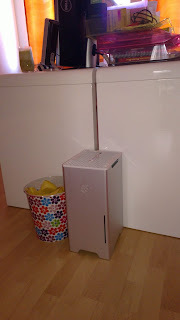 The problem might be that I'd like it to use 5ghz and it is near impossible to find decent antennas for that. 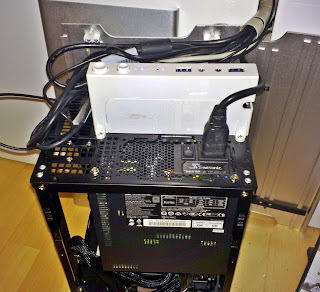 The antennas that ASrock included seem to be less than perfect. But honestly, I don't understand antenna tech very well... Maybe I do something wrong. Getting the system to work with Linux (that'd be openSUSE, of course) was easy-peasy. After my power supply arrived I had to rely on the integrated graphics and for that, upgrading to the latest kernel from kernel.opensuse.org as well as the latest stable Xorg from the X11:Xorg repo made sure it is now all smooth. Boringly little to say, everything works great and the system is butter smooth - something you'd expect from your new work station.